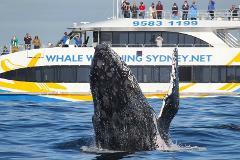 The Discovery Cruise is the number 1 family whale watching cruise in Sydney. The vessel is modern and comfortable, providing a smooth ride and lots of viewing space. The Discovery Cruise is the number 1 family whale watching cruise in Sydney. The vessel is modern and comfortable, providing a smooth ride and lots of viewing space. You will be out into the open ocean in only 15 minutes thanks to the high speeds of Ocean Dreaming II. Whilst on board, a marine naturalist and professional photographer will provide informative commentary. Our exclusive Discovery Cruise COMBO Pass includes an image pack of photos taken during the tour valued at $35! Allowing you to relax on board and enjoy your time with these majestic creatures. The COMBO Pass also includes a 24hr EcoHopper ticket valued at $45 which can be used within 48 hours of your Whale Watching Cruise. Ocean Dreaming II is designed to ensure optimum viewing from all areas. On board you will find three spacious decks, air conditioned cabins with large windows, and comfortable seating. The vessel is fully equipped with bathroom facilities and is wheelchair accessible. This cruise includes complimentary tea, coffee, bottled water and biscuits. Soft drinks, beer and wine are also available to buy at an onboard licensed bar.